We have come to the last day of our pilgrimage and we would be departing for home in a few hours. Some of you are excited at the prospect of returning home to savour your favourite Malaysian cuisine and the comfort of your homes. Others may be feeling sad, wanting to prolong the experience of this pilgrimage. I’m reminded of a commonly told story about St Scholastica near the end of her life. According to this story, St Scholastica paid an annual visit her brother, St Benedict, at a place near his abbey, and they would spend the day worshiping together and discussing sacred texts and issues. On this last visit, after a conversation over supper, St Benedict indicated it was time for him to leave. Perhaps sensing the time of her death was drawing near, Scholastica asked him to stay with her for the evening so they could continue their discussions. Not wishing to break his own Rule, Benedict refused, insisting that he needed to return to his cell. He can’t be caught out at night, even if it happens to be his own sister. At that point, Scholastica closed her hands in prayer, and after a moment, a wild storm started outside of the guest house in which they were housed. Benedict, alarmed by the sudden squall, asked, “What have you done?” to which she replied, “I asked you and you would not listen; so I asked my God and he did listen.” Due to the heavy rains and strong winds, Benedict was unable to return to his monastery, and they spent the night in discussion. Three days later, Scholastica died. Benedict had her body brought to his monastery, where he caused it to be laid in the tomb which he had prepared for himself. The point of me telling the story is simply this: please don’t pray too hard for this trip NOT to end. Some of us want to go home and the Filipinos would not appreciate a typhoon or Hurricane Edna blowing this way just because a few Malaysian pilgrims do not wish to leave the Philippines. St Scholastica, spare us, we pray. Today’s gospel passage makes a little geographical note that sounds illogical to anyone who understands the local terrain. Jesus was going from Tyre in the north to Galilee in the south; and he went by way of Sidon. That is to say, he started going due south by going due north! It’s like going from Kuala Lumpur to Johor Bahru by way of Penang. You have to ask Fr Simon Yong how this is done, because it all makes perfect sense to him – something about sectors and Enrich miles. 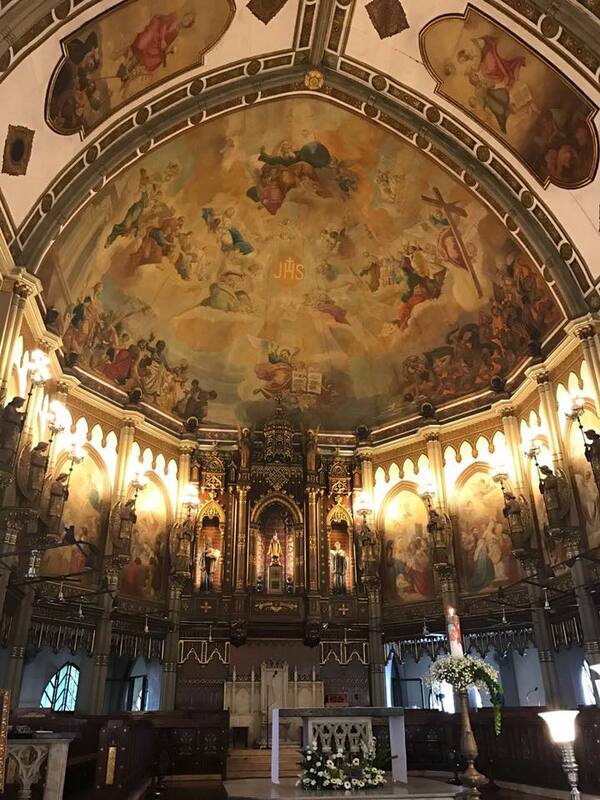 But I guess it also makes sense to all us who are on this pilgrimage too – we had to come to the Philippines, to learn how to be at home as Catholics in Malaysia. When Jesus did arrive back in the regions of Galilee, he came into the district of the Decapolis, and there they brought to him a man who was deaf and who had an impediment in his speech. I often have to tell hearing people that it is physiologically and factually inaccurate to describe Deaf persons as deaf and dumb. They are certainly not dumb as in stupid just because they do not communicate as we do. They also resent the politically correct term of “hearing impaired.” They would be quick to point out that most people who can hear are equally “signing impaired.” Neither are they mute. Most deaf persons can make sounds, and they can be exceptionally loud and noisy as they are not aware of the volume of their own voices. The scriptural note that put these two impediments together is logical, however. It was the man’s inability to hear which made his speech so imperfect. Perhaps there is no other miracle which so beautifully shows Jesus’ respectful way of treating persons. Truly, we witness here the true ramifications of the Incarnation – the inculturation of the gospel. He took the man aside from the crowd, all by himself. Here in the tenderest considerateness, the Lord takes this deaf man away from the scrutinising and prying eyes of an insensitive crowd and spared him the embarrassment which he must already be suffering as a deaf person living among the hearing. Throughout the whole miracle, and deaf people love this part, Jesus actually begins to sign to him. He put his hands in the man’s ears and touched his tongue with spittle. Jesus communicates to this deaf man through the senses which were available to him – his sight, his taste, his touch, his smell. And then Jesus looked up to heaven as a sign of prayer to show that it was from God that help was to come. Then he spoke the Word and the man was healed, recalling the act of creation in the Book of Genesis. Our short pilgrimage to our neighbour, the Philippines, though confined to Metro Manila, has truly been a similar experience of discovery through the opening of our senses. Our vision, our hearing, our sense of touch, taste and smell has been overhauled by a glimpse of God’s Truth, Beauty and Goodness. This experience has been for me and I believe for many of you, an Ephphata moment. As we visit the shrines and churches, and even when we encounter the poor, we are swept up into a sacred, beautiful, true, and most in-touch-with-reality point of view. In our participation we ask for the “eyes of faith” to put in sharp focus and vivid colour what God is bringing about in the world. We have become too over familiar and comfortable with our own iconoclastic and white-washed churches. We have become blind and deaf to the means by which God wishes to communicate to us. In the Incarnation, the ideas of life, reality, purpose, goodness, beauty, justice, and truth, are no longer external to us. In Jesus Christ we receive and “become part of” that goodness, beauty, justice, and truth. Rather than some form of escapism of flights of fancy, the sacraments puts us in touch with the reality of God Incarnate. Life and reality viewed through the sacraments put our most basic assumptions on trial. God is not somewhere else, too busy, or unconcerned with the created order. Instead, all of creation is “charged” with the goodness of God and every inch of it participates in the life of God sacramentally. In this way, the sacraments and sacramentals serve as a revelation of sorts, a window into what is most real, and helps us wonder more truly about what God is doing in the world. They help us to see sacredness even in the midst of human depravity, wealth in the midst of poverty, and redemption in the midst of human fallenness.